Payday! The one day of the month we all look forward to. Well until we realise that we do have to budget, pay bills and not rush into the the nearest department store (or Space.NK in my case) and blow it all. 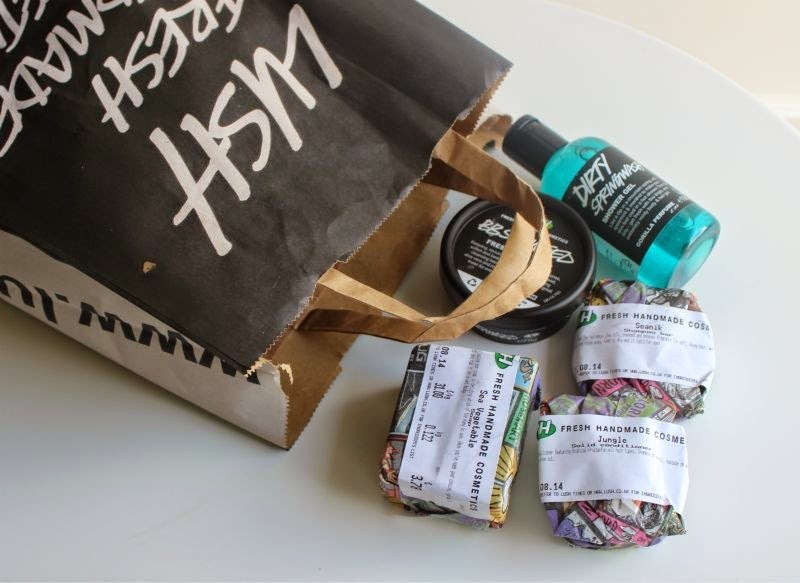 I do however like to treat myself every now and then (probably more than I should) and as I have been feeling a little out of sorts I decided to take myself along to Lush to stock up on goodies for a pampering weekend. That is a half lie, I initially went it to see if the Shark Fin Soap had been launched yet. It hasn't, well not in the UK anyway. So what's a gal to do? Shop that's what! Did you know that Lush use seaweed from the Poole Harbor which is caught (do you catch seaweed?) by a somewhat local celebrity Pete who is a fisherman and a fish restaurant owner (ate once there it was divine) in Poole. No? Well you do now ha! Anyway this face mask has been created to soothe, detox and is suitable for all skin types. Don't worry it doesn't smell of wet seaweed rather it has a calming fragrance - it reminds me a little of the scent of Sudocreme. I can't wait to wack this on tonight and let it go to work. I shall report back a.s.a.p! There is something so appealing about Lush soap, I think it is the huge, hulking beautifully decorated wheels that grace each store that lures me in. In a world of liquid soaps - traditional soap often gets overlooked. 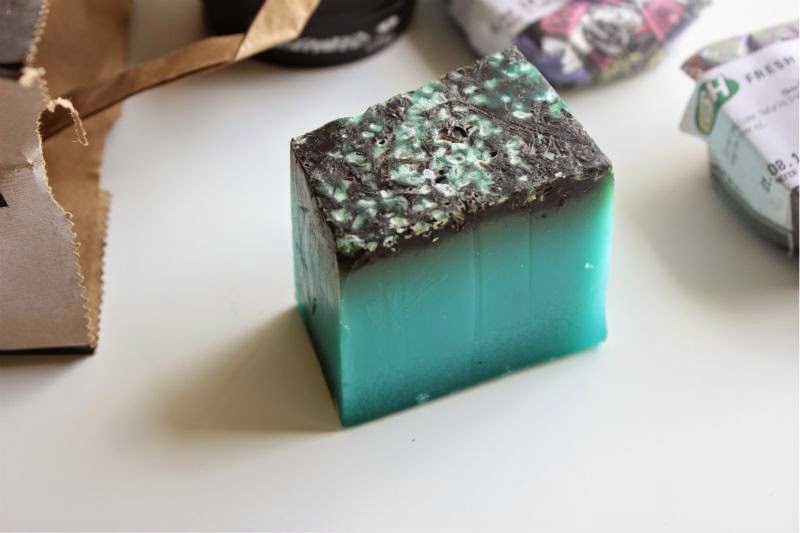 The almost cliff side design of Lush Sea Vegetable Soap sold me on the spot, the fact that it smells divine and is anti-septic and exfoliating is only a bonus really. This is more of an in-shower soap rather than a hand soap as it gently buffs away dead skin as well as cleansing - think of it as a natural body scrub come shower gel combined in one. Scent wise this has zesty lime fragrance which works beautifully with the sea salt and seaweed ingredients. Now all credit to the lovely salesgirl who helped me out today, she did advise that someone with full, crazy hair like myself (in secondary school I was often referred to as Shakira) would probably be better with a less volumising shampoo. However one whiff of Seanik and I wasn't going home empty handed. The idea is that Seanik combines sea salt and again seaweed to gently but thoroughly cleanse the hair and scalp - it does also add volume to the roots of the hair. It has the most beautiful, clean aquatic fragrance that reminds me of the Spanish sea. Let's all gather hands and pray that my hair doesn't become too full...then again I could stash my secrets in it! Solid conditioner? They really do think of it all! One thing noone tells you about having long, thick hair is just how much conditioner you will go through annually. My hair drinks the stuff, I kid you not I go through a full bottle a week with ease. Anyway in a bid to keep myself out of the red I thought Lush Jungle Conditioner may be a clever route to go down? Being solid I figure I use less? So many questions, so little answers - I am going to use this all week long and see if it makes any difference and if it is a good alternative to liquid conditioners. Stay tuned! Have I mentioned that I love mint scented things? Oh yeah only a billion times. Sorry! I bought Lush Ice Blue Shampoo last month when it was on limited release via the Lush Kitchen and fell head over heels (heart eye emoji) for the scent. Luckily Lush Dirty Springwash shares the same fragrance and although a shower gel can be used on the hair. I'm pretty sure the "Dirty" range of products have been created with men in mind but next month I know what I'll be purchasing. I'm happy to learn that I can even purchase Dirty as a stand alone fragrance. It's the little things in life that keep me going ha! Do you have your eye on anything from Lush? I fully recommend Lush Ultrabland, it is such a great balm cleanser! i love the Sugar Scrub from lush! It works wonders on my skin! Me too :) I could spend all day in there! I love their solid shampoos, especially NEW! and Jumping Juniper. Jumping Juniper is the most lovely lavender scent so it's great for before bed and I found it made my hair super shiny. NEW! is AMAZING! It's a really spicy smell, like cinnamon and clove tea, and I swear it makes my hair grow faster and softer! I very highly recommend both products. 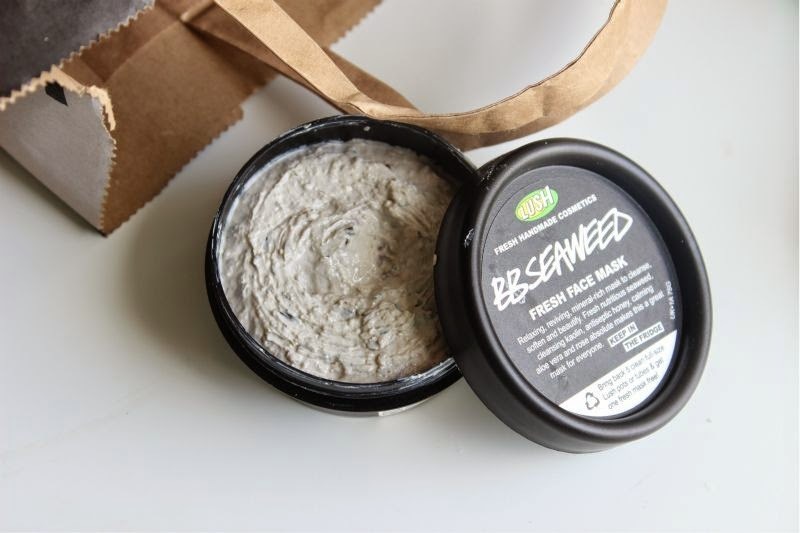 I love the BB Seaweed mask, you won't be disappointed! Honestly, the Jungle solid conditioner wasn't amazing for me, as I found it didn't really melt in my hands, but their other solid conditioner "Big" is a lot nicer (and has sea salt in it too!). 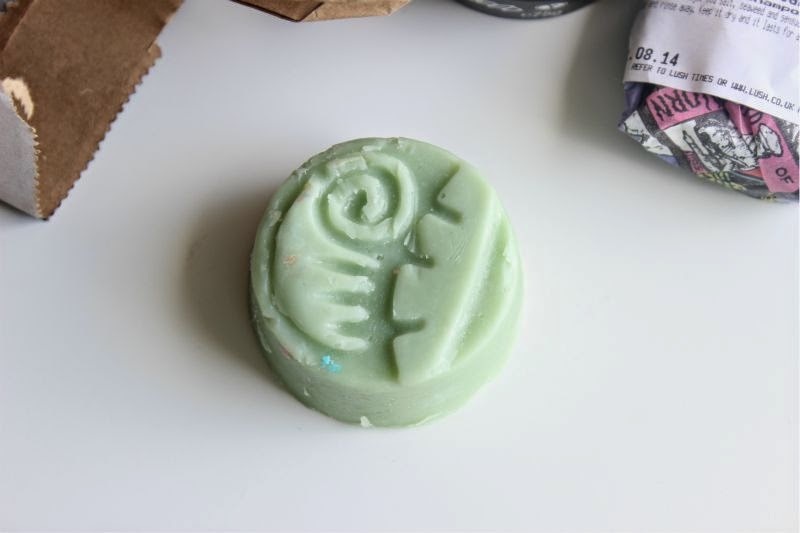 That sea vegetable soap looks so intriguing!!! I'm very interested in the conditioner bar, let us know how it works out! All of these items definitely give off a strong summer vibe! They all sound amazing, I love the vibrant aqua colours too. I've had the solid shampoos before, the jumping juniper one was lovely, and I had the white one too but I cant remember what it was called. Anyway it made my hair really shiny. I like the sound of the conditioner aswell. I love LUSH! It has to be one of my favourite shops of all time! You are right. Lush in Glasgow is amazing. The staff are all lovely. I could spend all day in there just sniffing stuff. I always leave having spent way more than i planned. My complete fav is the soft coeur. Its just so sweet and luxurious. I used to use it with the coconut powder but they dont do that anymore. was often asked what perfume I was wearing when I used this. 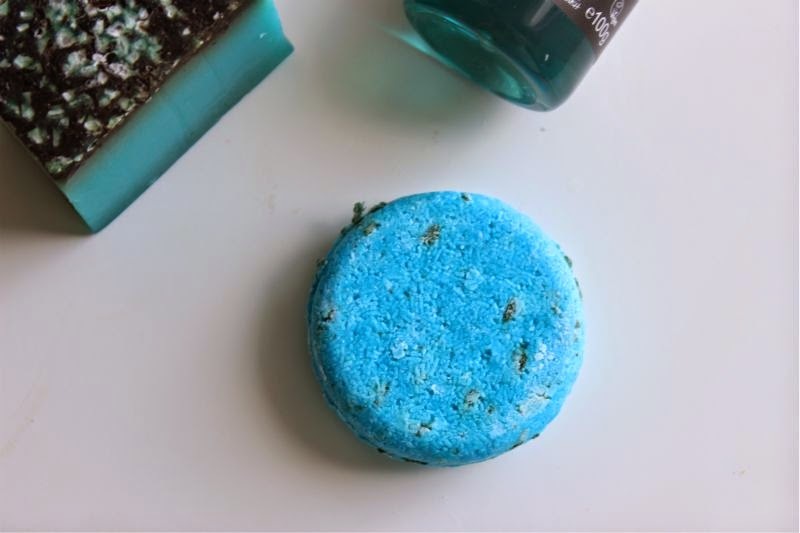 That blue soap is so pretty! I daren't go into Lush at the moment or I'll probably end up coming out with half of the store, which I certainly can't afford!